8/6 Cup of Coffee: In the immediate aftermath of last week's trade deadline, the Red Sox promoted several players throughout the minor leagues. If Sunday's contests were any indication, those players are totally ready to take on the challenge of that tougher level of competition. 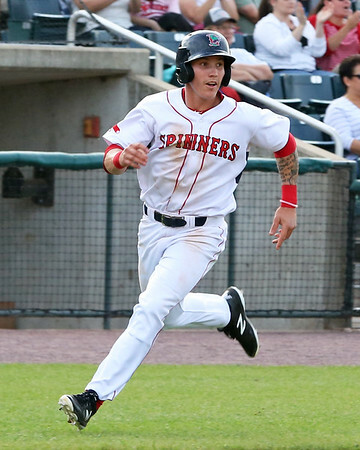 Bobby Dalbec blasted his first two Double-A homers, while Josh Ockimey went deep for Pawtucket. Jarren Duran (pictured) continues his meteoric professional debut going with Greenville, and Denyi Reyes brought his ability to mystify hitters with him in his Carolina League debut. The PawSox jumped off to an early lead on Sunday afternoon when Josh Ockimey blasted a three-run homer in the bottom of the first. It was Ockimey's second blast in three games since a Thursday promotion from Portland. The Red Wings clawed their way back against Justin Haley, tying the game with a three-run rally in the third. In all, Haley allowed three in six innings, striking out seven and walking three. It was a tough outing for Marcus Walden, who gave up three runs in 1 2/3 innings to take the loss. Travis Lakins turned in a scoreless seventh, as he continues to thrive in a short-relief role. In 22 appearances across two-levels since converting to his current usage, he surrendered a run in only three. In his third Eastern League game, Bobby Dalbec picked up where he left off in Salem. The third baseman powered a pair of home runs, the second a tape-measure blast estimated at 451 feet. Dalbec now has 28 home runs between two levels. He also continues to be the epitome of the three-true-outcomes player: in his other three plate appearances, Dalbec walked twice and struck out once. Teddy Stankiewicz turned in a quality start, allowing three runs on six hits in seven innings, striking out six against just one walk. It was the fifth consecutive start that Stankiewicz has thrown at least seven innings. Continuing the trend of recently-promoted players having standout performances, Denyi Reyes was excellent in his Salem debut. The right-hander scattered five hits over 5 2/3 shutout frames, striking out four and walking one. Across two levels, Reyes now sports a 1.81 ERA and 126-to-14 strikeout-to-walk ratio. Josh Tobias homered twice as part of a three-hit afternoon in his return from a rehab assignment. Tyler Hill also had three hits, along with two RBI and his 23rd stolen base of the year. A 19-hit barrage powered the Drive, who salvaged a split in their four game series with Rome. The victory was keyed by yet another player who moved up in the chain of promotions following the trade deadline, as Jarren Duran was 5 for 5 on the day. The effort by Duran completed a 10-for-17 series in his introduction to the South Atlantic League. Tanner Nishioka had a pair of home runs, along with a single and a walk. Enmanual De Jesus turned in a solid start while benefiting from the offensive outburst, allowing two runs on eight hits in six innings. Austin Glorius continues his long road back from a spring training ankle injury. In his first appearance since joining Greenville, he pitched a scoreless inning with a walk and a strikeout apiece. Unfortunately for the Spinners, Sunday was for recently-promoted players to sign, and the chain has not yet gotten them any reinforcements from the Gulf Coast League. Fifth-round pick Thad Ward got the start, allowing two runs (one earned) in three innings. Ward's three walks marked the first appearance in which he'd had more than one. Hunter Haworth turned in another solid outing in a piggyback role, allowing a run in four innings, striking out four and walking two. Player of the Day: It's a difficult choice when more than one player connects for multiple homers, but the pick for Sunday's contests didn't hit any. Jarren Duran had five hits, bringing the ninth-round draft pick's season line up to .372/.414/.564. He has multiple hits in nearly half of his professional appearances, with two or more more hits in 19 of 41 games, and at least three hits six times.